This is a post I shouldn’t been making. There are deadlines chasing me but my brain is really drained so I cannot focus anymore enough to write articles for clients. So here is this quick post, updating you on what’s been cooking around here those last couple of days. Fresh Brussels sprouts cut in half. Brussels sprouts. My first contact with them was traumatic. I was 6-7 years old and some uncle from my father’s family was throwing some kind of dinner party, I have no clue why. There were many fancy dishes that I hated, like shrimp cocktails drowned in mayo and those little things that tasted like hell. Yes. 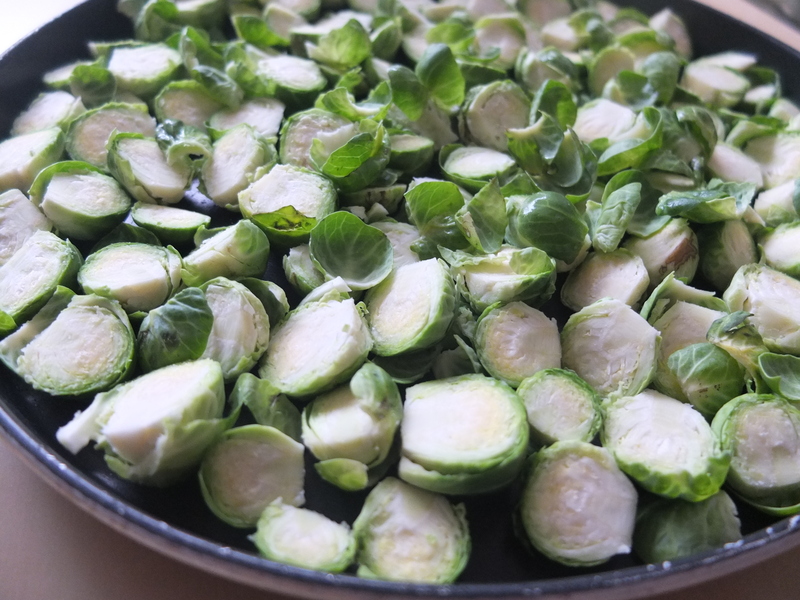 Boiled Brussels sprouts. Everyone on the kids table hated them and we were pushing them at the side of our dishes, along with other fancy stuff that we could not recognize. My grandmother had a paper bag and went around to hide the evidence of the kids not appreciating the dinner. I am not sure if her dog (RIP Elsa) appreciated those delicacies. My favorite cousin was eating everyone’s Brussels sprouts because of a dare, I think. I believe this is when I started admiring him. Anyone who could eat that crap must have a huge will power, right?! Fortunately, in Greece Brussels Sprouts are not common at all. I think that you actually only see them in hotel dinners. So I did not have to eat them again for ages. 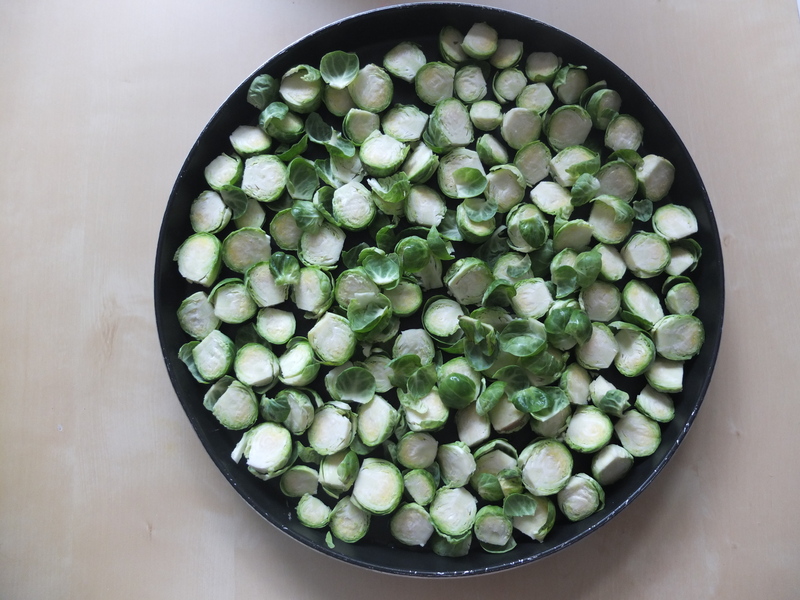 In April 2012 though, that we became vegan and lived in the Netherlands, I read a recipe about roasted Brussels sprouts and the author kept repeating something along the lines of “I know you hated Brussels sprouts as a child, but you will love them cooked this way!”. Soon enough I discovered that just a few thousand kilometers north of the Mediterranean, people actually force feed that stuff to their kids. Usually they will steam or boil them to death and then hide them under mashed potatoes. Or at least that is the impression I got. Feeling grateful that I didn’t have to go through this torture as a child, I decided to try them roasted. My roasted Brussels sprouts. Do they look a bit burnt? It’s because I burnt them a little. New oven. 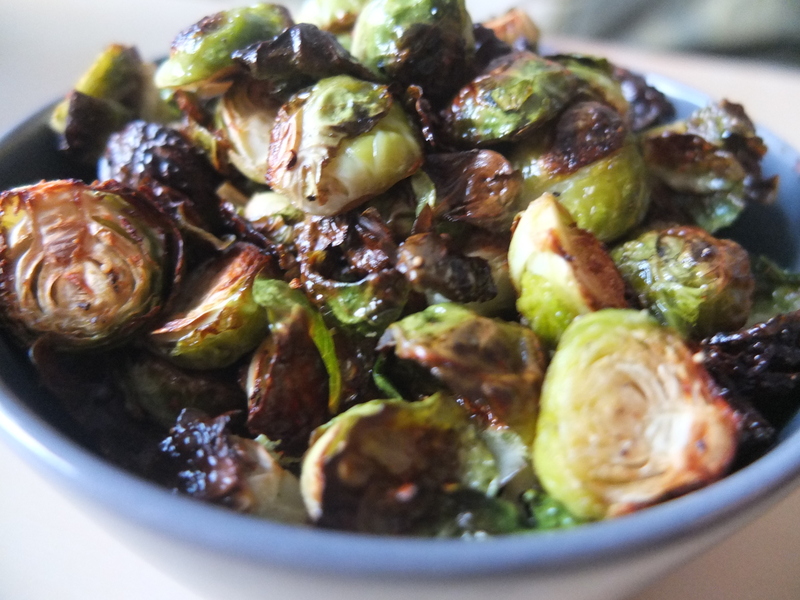 Since that first try, roasted Brussels sprouts have been a favorite snack for both me and my husband. They are supper easy to make. Cut the bottom part, that is hard. Put them in a bowl with a bit of olive oil, salt and pepper and massage them until the olive oil goes everywhere. Put them in a baking pan with the cut side up. Bake for 15 minutes at 200C or experiment a bit based on how strong your oven is. You will love them. Trust me. They are also great steamed, but you have to steam them for just 5-6 minutes, otherwise they become very bitter with a mushy texture that is quite unpleasant, if you ask me. 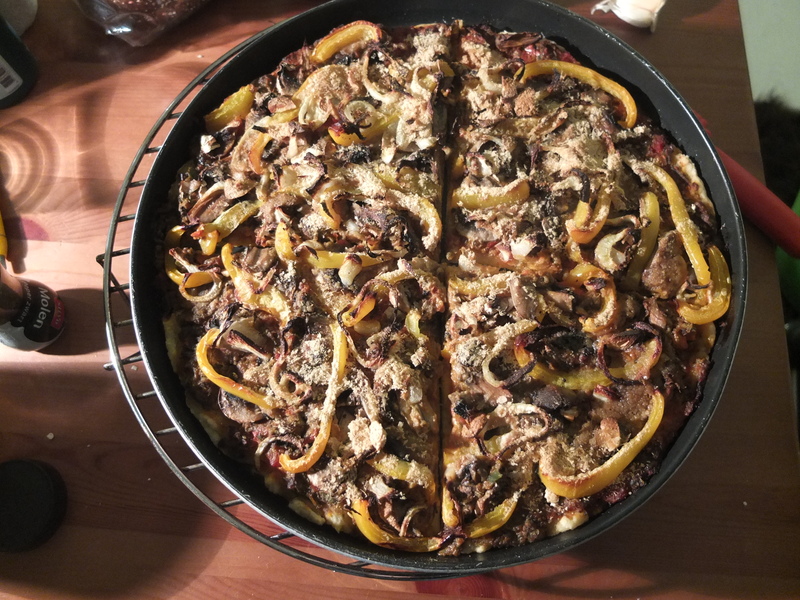 Do you remember that orange “tapenade” that I made last week? Well this week I decided to make a proper one, containing black olives, capers, cherry tomatoes and cucumber. I was so sure it would turn out great, that I made a huge amount. We ate some of it with some vegan nori rolls that I made a few days ago, but we still had a ton left and I worried it would go bad. We also had half a jar of pasta tomato sauce in the fridge, so I decided to make a pizza using those. I won’t give you instructions for it, as I didn’t measure anything, but I can loosely describe the process. First, I took a cup of flour that we had lying around and mixed it with about two tablespoons olive oil and enough warm water to make a dough. I spread the dough on a baking pan to make a very very very thin pizza crust. I topped it with the tomato sauce. Then I sprinkled with nutritional yeast. Then I spread a layer of the olive tapenade. 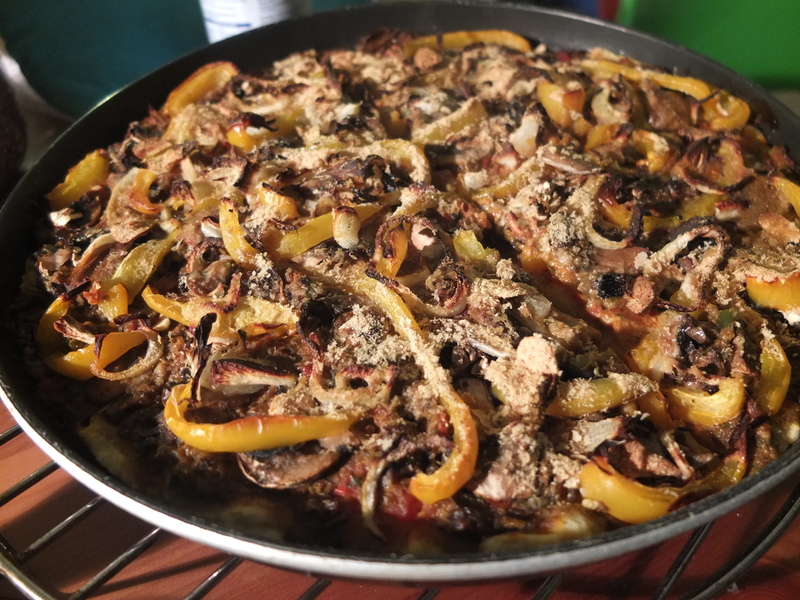 I topped it with fresh mushrooms and a yellow bell pepper cut in thin slices. Then I added some onion rings and a few slices of garlic. I drizzled it with olive oil and sprinkled with the rest of the nutritional yeast. I baked it at 200C for 45 minutes. It turned out great, if I may say so myself. I ate my half because I couldn’t wait for N. to come back from work, but I saved him half the pizza so I guess this makes me good enough of a wife. Everyone loves pizza, let’s be honest here. On other news, we are doing tons of laundry these days because after the moving I am unsure of what is washed and what needs to be refreshed. So two days ago I loaded the laundry machine and because sometimes it stops without warning (it’s a second hand one. I think it was abused), I sat in front of it in the bathroom floor, to make sure that all is going well. And even though it was pretty obvious that the washing machine was working perfectly, I felt the urge to sit there and just watch it go round. I was stuck there for about 30′ and felt absolutely relaxed. What is wrong with me? Has anyone else ever been hypnotized by their washing machine? Very nice and great recipe!